The Woman's Study Bible, NKJV - Receiving God's Truth for Balance, Hope, and Transformation - is a beautiful combination of a study bible and devotional bible. 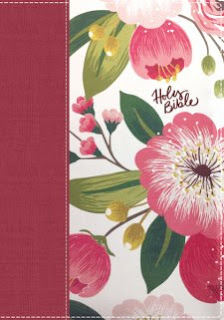 This bible features a floral printed cloth hardcover, full color graphic elements as well as an easy to read font. This well made bible is sure to become any woman's favorite bible. The bible comes with a hardcover presentation box, making it perfect for gift giving. For any reader who enjoys the New King James Version of the bible- this will be one bible that can stand the test of time with its study features, articles and devotionals themed for women. This bible is the perfect way to encourage bible reading. This solid, well made bible has a retail price of $79.99 which makes it a bit expensive. For those looking for a bible to last a lifetime, it will be a good investment or it would make a great gift. The price may be prohibitive for most readers. I would like to see this bible available in other versions as many modern readers may prefer a an NIV or NLT version. The NKJV is a traditional and trustworthy translation, but not as easy to understand subtle theological concepts for some readers who may be new to the bible. As a blogger for booklook bloggers I received a copy of this bible for the purpose of writing this review.